Chemotrophs are organisms that obtain energy by the oxidation of electron donors in their environments. These molecules can be organic (chemoorganotrophs) or inorganic (chemolithotrophs). The chemotroph designation is in contrast to phototrophs, which utilize solar energy. Chemotrophs can be either autotrophic or heterotrophic. Chemoautotrophs are commonly found in ocean floors where sunlight cannot reach them because they are not dependent on solar energy. Ocean floors often contain underwater volcanos that can provide heat to substitute sunlight for warmth. Originally used with a different meaning, the term took its current definition after Lwoff and collaborators (1946). Chemoautotrophs (or chemotrophic autotroph) (Greek: Chemo (χημία) = chemical, auto (αὐτός) = self, troph (τροφιά) = nourishment), in addition to deriving energy from chemical reactions, synthesize all necessary organic compounds from carbon dioxide. Chemoautotrophs use inorganic energy sources, such as hydrogen sulfide, elemental sulfur, ferrous iron, and also molecular hydrogen, and ammonia. Most are bacteria or archaea that live in hostile environments such as deep sea vents and are the primary producers in such ecosystems. Chemoautotrophs generally fall into several groups: methanogens, halophiles, sulfur oxidizers and reducers, nitrifiers, anammox bacteria, and thermoacidophiles. An example of one of these prokaryotes would be Sulfolobus. Chemolithotrophic growth can be dramatically fast, such as Thiomicrospira crunogena with a doubling time around one hour. The term "chemosynthesis", coined in 1897 by Wilhelm Pfeffer, originally was defined as the energy production by oxidation of inorganic substances in association with autotrophy - what would be named today as chemolithoautotrophy. Later, the term would include also the chemoorganoautotrophy, that is, it can be seen as a synonym of chemoautotrophy. Chemoheterotrophs (or chemotrophic heterotrophs) (Gr: Chemo (χημία) = chemical, hetero (ἕτερος) = (an)other, troph (τροφιά) = nourishment) are unable to fix carbon to form their own organic compounds. 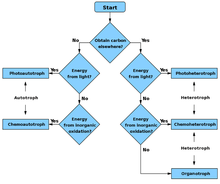 Chemoheterotrophs can be chemolithoheterotrophs, utilizing inorganic energy sources such as sulfur or chemoorganoheterotrophs, utilizing organic energy sources such as carbohydrates, lipids, and proteins. In the deep oceans, iron-oxidizing bacteria derive their energy needs by oxidizing iron(II) to iron(III). The extra electron obtained from this reaction powers the cells, replacing or augmenting traditional phototrophism. In general, iron-oxidizing bacteria can exist only in areas with high iron concentrations, such as new lava beds or areas of hydrothermal activity (where there is dissolved Fe). Most of the ocean is devoid of iron, due to both the oxidative effect of dissolved oxygen in the water and the tendency of prokaryotes to take up the iron. Lava beds supply bacteria with iron straight from the Earth's mantle, but only newly formed igneous rocks have high enough levels of unoxidized iron. In addition, because oxygen is necessary for the reaction, these bacteria are much more common in the upper ocean, where oxygen is more abundant. What is still unknown is how exactly iron bacteria extract iron from rock. It is accepted that some mechanism exists that eats away at the rock, perhaps through specialized enzymes or compounds that bring more FeO to the surface. It has been long debated about how much of the weathering of the rock is due to biotic components and how much can be attributed to abiotic components. 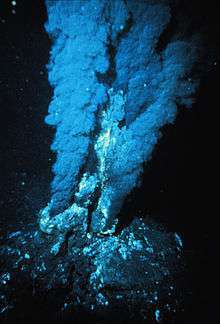 Hydrothermal vents also release large quantities of dissolved iron into the deep ocean, allowing bacteria to survive. In addition, the high thermal gradient around vent systems means a wide variety of bacteria can coexist, each with its own specialized temperature niche. Regardless of the catalytic method used, chemoautotrophic bacteria provide a significant but frequently overlooked food source for deep sea ecosystems - which otherwise receive limited sunlight and organic nutrients. Manganese-oxidizing bacteria also make use of igneous lava rocks in much the same way; by oxidizing Mn2+ into Mn4+. Manganese is much rarer than iron in oceanic crust, but is much easier for bacteria to extract from igneous glass. In addition, each manganese oxidation yields approximately twice the energy as an iron oxidation due to the gain of twice the number of electrons. Much still remains unknown about manganese-oxidizing bacteria because they have not been cultured and documented to any great extent. ↑ Davis, Mackenzie Leo; et al. (2004). Principles of environmental engineering and science. 清华大学出版社. p. 133. ISBN 978-7-302-09724-2. ↑ Dworkin, Martin (2006). The Prokaryotes: Ecophysiology and biochemistry (3rd ed.). Springer. p. 989. ISBN 978-0-387-25492-0. ↑ Bergey, David Hendricks; Holt, John G. (1994). Bergey's manual of determinative bacteriology (9th ed.). Lippincott Williams & Wilkins. p. 427. ISBN 978-0-683-00603-2. 1. Katrina Edwards. Microbiology of a Sediment Pond and the Underlying Young, Cold, Hydrologically Active Ridge Flank. Woods Hole Oceanographic Institution.